Are you an espresso snob? Is this because you know that quality matters, and sometimes if you want something done right you have to do it yourself? With espresso this is especially true, and here are some tips, hints, and common problems to diagnose to help you in your mission for the perfect espresso! What are Mottling and Tiger Striping? How Much Coffee Should I Use for an Espresso? How Long Should I Continue the Espresso Extraction? How Will I Know if I Have Over-Extracted the Espresso? What is Progressive Pre-infusion or Natural Pre-Infusion? How Can I Tell if My Espresso Shot Has Been Under-Extracted? Blonding describes the color change of an espresso shot being pulled as it changes from dark brown to more of a tiger-striping and then a very light and and uniform-colored pale blond at the end of the pull, signaling the right time to end the extraction. Don’t let the shot run too long once it starts pouring blond or it will dilute the flavor in the body of the espresso. The espresso brewing term channeling refers to the undesirable effect of the espresso machine’s hot, pressurized water passing too rapidly through some parts of the puck – the roasted, ground coffee in the portafilter – while not passing sufficiently through other parts of the puck. When this occurs the shot will be under-extracted, and the stream coming out of the portafilter will show blond streaks. When you take off the portafilter and examine the puck you may be able to see small holes, about the diameter of pencil lead, penetrating the puck where the channelling occurred. Indicators of a fine espresso shot with a proper amount of extraction, mottling and tiger striping is the result of the espresso stream containing both lighter and darker crema. The artisan espresso shot is one in which this mottling and tiger striping occurs from the beginning to the end of the espresso brewing process. The mottling appears as splotches of reddish-brown and speckling of a darker brown color painting the crema. The coffee’s crema is the the thin and dark golden brown layer atop the espresso shot and contains much of the shot’s aromatics and nuanced flavors. Crema is created due to the machine’s high pressure dispersing gases within the liquid, and contains emulsified oils. Extraction involves forcing very hot water from the espresso machine boiler, at high pressure, through the roasted, ground coffee that has been tamped (compacted) into the portafilter basket. The result of this high pressure extraction is that essential oils and flavors including lipids and colloids as well as other elements in the coffee beans are released into the water becoming part of the brewed espresso shot. Extraction also occurs during the coffee brewing process although the water is not under pressure. If you are going to the trouble to brew up a gourmet espresso shot you might as well make it a double, and for this you should use about 14 grams of roasted, ground gourmet espresso coffee. Once you hit the brew button on your espresso machine an ideal time for optimal extraction is about 22 seconds although this may vary depending on how how you tamped (compacted) the coffee, how fine of a grind size you used, the temperature of the water during brewing, and other more subtle factors. Short answer: Harsh, bitter brew! Longer answer: Various clues are classic indicators of espresso over-extraction and if you observe closely these clues may let you know that you have over-extracted your espresso shot allowing too many of the coffee’s solids and unpleasant components to be released into the brewed solution. One clue may be that the espresso has too small of a volume and also has a thin and quite dark crema on top. Or perhaps there is a dark halo along the edge of the demitasse. One cause of this may be that the brewing temperature is too hot. The pre-infusion of espresso involves pre-wetting the roasted, ground coffee in the portafilter basket before you begin brewing the espresso. The goal is to improve the overall extraction of the finest flavors and aromas from the roasted and ground coffee. This may occur automatically in your espresso machine with the pump providing hot water to the coffee for about one or two seconds, then pausing for one or two seconds, and then the pump commences brewing. This feature is found in some Automatic Espresso Machines as well as super automatic espresso machines. Progressive (natural) pre-infusion is the term for coffee brewed using the E61 grouphead. Upon activation of the espresso machine pump a secondary chamber fills before the machine’s full pressure is applied to the bed of roasted, ground, and tamped (compacted) coffee in the portafilter basket. The result of progressive pre-infusion is a secondary grounds saturation time lasting from three to seven seconds before full pressure is applied. Progressive pre-infusion (natural pre-infusion) is generally considered superior to pump pre-infusion, or pause active pre-infusion. If the espresso brewed too fast and/or with too much volume there is a good chance that the brewed espresso shot will suffer from under-extraction and too few of the coffee’s fine flavors and aromas were released into the brewed espresso. The taste will likely be quite dull, and the espresso will be weak and uneventful. The crema will likely be very light blond in color, revealing to you with a visual confirmation the sad state of affairs that has just occurred: an under-extracted espresso shot. Too rapid of an extraction may also create a sour taste with cinnamon colors in the crema. 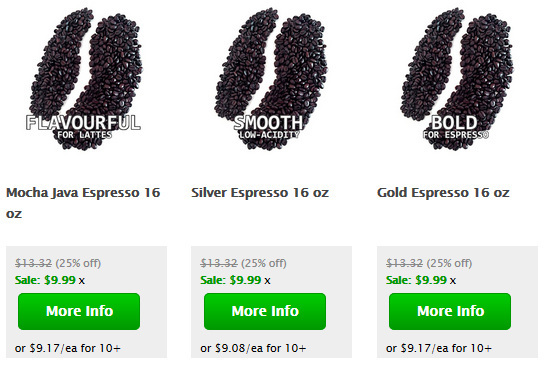 Espresso Coffee Guide provides detailed information on all of the world’s top Gourmet Coffees as well as tips for preparing Espresso Drinks. We also teach you how to Pull A Perfect Espresso Shot and provide a comprehensive How to make Lattes and Cappuccinos. If you prefer brewed coffee over espresso then see our section on Coffee Brewing. Does a coffee term have you puzzled? See our Coffee and Espresso Glossary and while you are at it visit the World’s Best History of Coffee.